The liturgical life of Saint Brigid Parish is embodied in our communal prayer throughout the week and throughout the Liturgical Year of the Church. This takes shape in many forms: Mass, Sacraments, Liturgy of the Hours and various other rites that flow from our Sunday Celebration of Eucharist as a community. 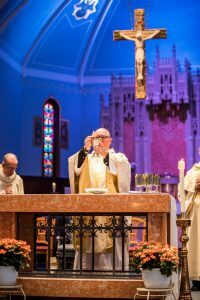 The center of a parish liturgical life is the Sunday Eucharist celebrated on the Lord’s Day. The parish gathers on Sunday, as a community of believers, the Body of Christ, to offer praise and thanksgiving to God.